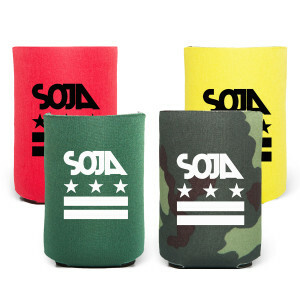 Collapsible drink koozie featuring SOJA's classic Stars and Bars design on the front, back, and bottom. Available in camo, red or yellow. Got my camo koozie as a free gift with my purchase, which was super great &amp; thoughtful! couldn't be more stoked to show it off, keeping my beverage coool in style ;) &lt;3 Best Koozie Ever!